Regular physical activity in children and adolescents—as with adults—promotes health and fitness. 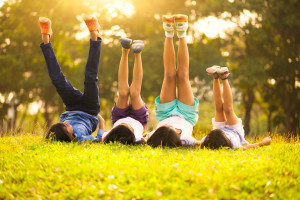 Compared with those who are inactive, physically active children have higher levels of cardiovascular fitness and stronger muscles, perform better in school, and are less likely to suffer from anxiety and/or depression. Physically active kids also are less likely to become overweight or obese, which is a major public health issue today. In fact, during the past 30 years, the childhood obesity rate for preschool children ages 2–5 has more than doubled—and has more than tripled for children ages 6–11. [i] Today, nearly 9 million children over 6 years of age are considered obese. Based on the 2008 Physical Activity Guidelines for Americans, children and adolescents should participate in at least 60 minutes or more of physical activity each day. It’s also important for parents to take responsibility for raising fit children by helping them participate in a variety of age-appropriate activities, establishing a regular schedule for physical activity, incorporating activity into their daily routine, keeping activities fun so children stay engaged, and setting a good example by embracing a more physically active lifestyle themselves. Restrict television, movies, videos, and computer games to less than two hours a day. If it’s safe to walk or bike rather than drive, do so when you can. If your child is too young to bicycle to school on their own, bicycle with them if possible! Set the example for your children by using stairs instead of elevators and walking up escalators, rather than just standing on them. Plan family outings and vacations that involve activities such as hiking, bicycling, skiing, and swimming. Give your children some age-appropriate household chores that require physical exertion. Mowing lawns, raking leaves, scrubbing floors, and taking out the garbage not only teach responsibility but can be good exercise. Observe sports and activities your children like, and then find out about lessons and clubs. Some children thrive on team sports; others prefer individual activities. Choose fitness-oriented gifts—jump rope, mini trampoline, tennis racket, baseball bat, a youth membership at the local YMCA or YWCA—and minimize the “low activity” gifts such as video games. Take advantage of your city’s recreation opportunities, from soccer leagues to fun runs. Strollers and playpens are high on convenience but low on activity potential. Try to free your infant from these mechanical restraints whenever and wherever he or she can safely move around. [i] Institute of Medicine. Childhood obesity in the United States: Facts and Figures. September 2004. [ii] U.S. Department of Health and Human Services. Physical activity guidelines advisory committee report. Washington, D.C.: U.S. Department of Health and Human Services, 2008.